Susan: Hi Mr. Schu! Hi Matthew! Thank you for this interview. I am honored to be chatting with you and Matthew. So far 2018 is awesome! I hope it’s going well for you, too. I am especially excited about this book that will be in the world soon. It’s been such a thrill to work with Matthew. The way he has brought this story to life is beyond expectation and causes me to dance and sing every time I read it! Matthew: Hi, John! 2018 has gotten off to a solid start. I’m typing this from the middle of a week of fun school visits in Texas. Looking forward to seeing what comes from here! Thank you, Susan and Matthew! Matthew, why should everyone take off Rock ‘N’ Roll Soul’s dust jacket? Susan and Matthew, have you ever participated in a talent show? If yes, what was your talent? Susan: I have never participated in a talent show actually. I did a lot of musical theater in middle school and played piano and sang in the chorus but never entered a show. I do love being an enthusiastic audience member!! Matthew: Sadly, I never did. Unless you count spelling as a talent… I came in second place in our 4th grade Spelling Bee. Correct spelling is pretty rock ‘n’ roll, right? Matthew, please take us through the process of making one of the illustrations for Rock ‘N’ Roll Soul. Matthew: This book was drawn in pen and ink and colored with watercolor. I tried to keep my line as loose as possible to give each drawing a bit more of that punk rock vibe. There are a lot of pages that are, like, musical daydreams of our protagonist. In those sections, we switched it up a bit with the color, which was a lot of fun. 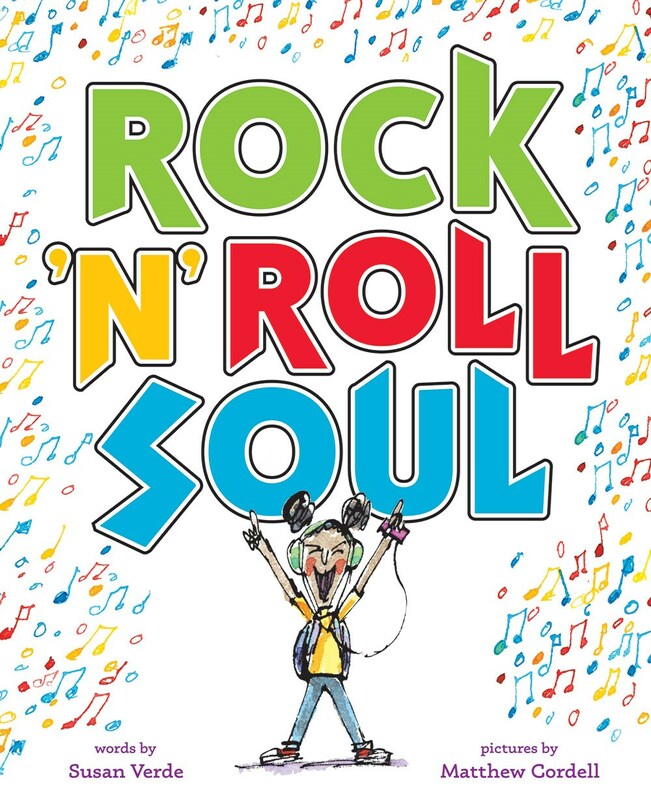 Susan: … is meant to get people tapping their feet and nodding their heads and eager to read the book to find out more about how music in all its forms not only inspires this rock n roll girl but also the reader to celebrate his or her own musical style! 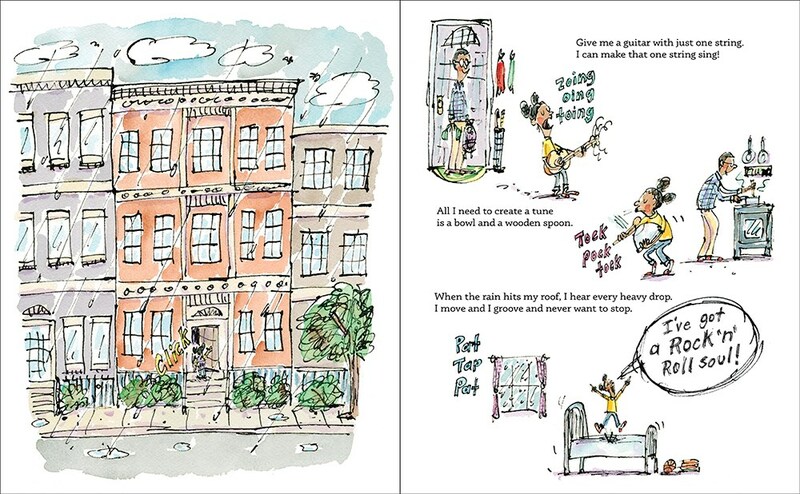 Matthew: … is a wonderful way to introduce readers to the sweet rock ‘n’ roll essence of our book! Susan: “Lola” by The Kinks and “Roxanne” by The Police and “Rise” by Pearl Jam and “Ironic” by Alanis Morissette…. oh gosh did you say one? Matt: “Baba O’Riley” by The Who. Look for Rock ‘N’ Roll Soul on May 15, 2018. This looks like a lot of fun! 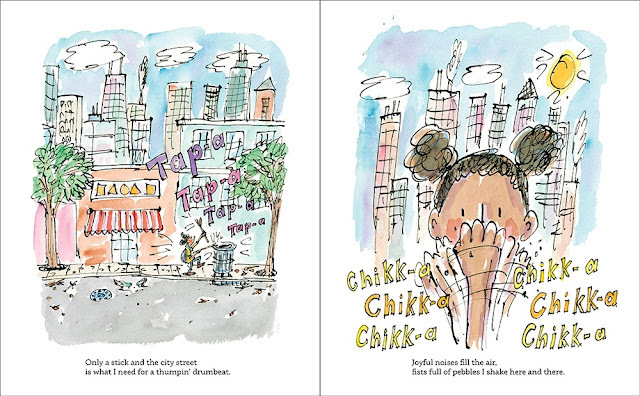 Also looking forward to the Caldecott interview. Wolf in the Snow is truly deserving.